Colorado’s largest one-day online giving event is coming up and we need your support. On Tuesday, December 4, 2018, thousands of donors will #GiveTogether to support Colorado nonprofits like ours. Colorado Gives Day is an annual statewide movement to celebrate and increase philanthropy in Colorado through online giving. yampavalleygives.org is a year-round webpage within the ColoradoGives.org website that links to profile pages of local nonprofits serving the Yampa Valley, providing comprehensive, objective, and up-to-date information about each organization, and providing an easy way to support them online. It’s the one-stop shop to GIVE WHERE YOU LIVE! Colorado Gives Day features a statewide $1 Million Incentive Fund, one of the largest giving day incentive funds in the country. Every nonprofit receiving a donation on Colorado Gives Day will receive a proportionate share of the Incentive Fund, which increases the value of every dollar donated. 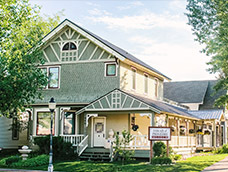 Supporting the Tread of Pioneers Museum on Colorado Gives Day helps us continue to preserve and share the rich history and heritage of Routt County. As a bonus, along with many other local nonprofits, the Tread of Pioneers Museum is now a Colorado Enterprise Zone Contribution Project. This means that a donor who makes a contribution to the museum of $250 or more, may claim a Colorado income tax credit of up to 25 percent of the amount of his or her donation. This dollar-for-dollar credit against Colorado state income taxes can be claimed by the donor in addition to any federal or state income tax deductions. For more information, contact Candice Bannister at 970.879.2214 or cbannister@treadofpioneers.org, or talk with your tax advisor.